The following works are currently unpublished but available for purchase and performance from this website. In some cases, I have great recordings of these works, but in other cases, I can only offer a MIDI representation at this time. I would love to hear your group perform these works, and add your performance to my website! 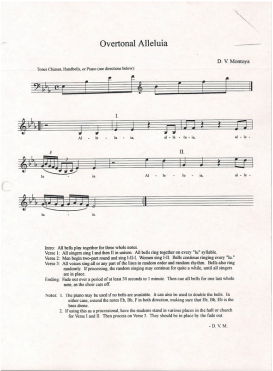 If a piece says [FREE DOWNLOAD] then you may copy it, test it out, and perform it at no charge. 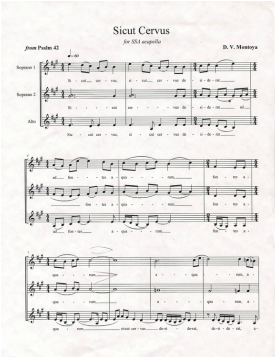 This piece was commissioned by Dr. William Wells Belan for his Bridge Concert. This yearly concert highlights the accomplishments of a local community organization and celebrates them with newly written music. . .5 composers, 5 choirs. I was asked to write a piece for my alma mater high school, Mountain View High School. 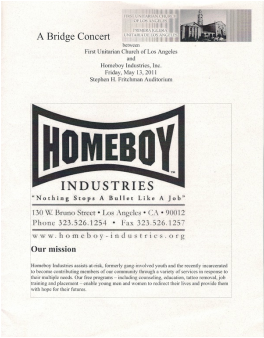 Their director, Nancy Ludwig, and I prepared our students for a wonderful collaborative performance to benefit Homeboy Industries in Los Angeles. CLICK HERE to read a newspaper article about the event. The current version is for ukulele ensemble (from La Habra High School). A future version will use piano or harp. 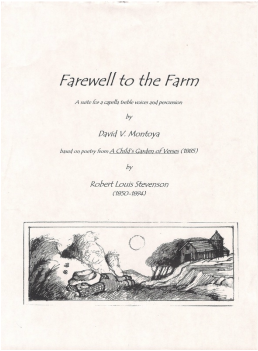 Farewell to the Farm is a set of seven childhood snapshots as characterized by Robert Louis Stevenson in his first published volume of poetry "A Child's Garden of Verses" (1885). My musical setting of these texts was developed over the 10 years, from 1994-2003, as each number was performed, refined, and filed away. . .performed, refined, filed away again. . expanded from four songs to seven, and then refined once more. The result was an arch-formed pictograph on the four natural elements of life and the quintessence of childhood. Mvt. 1 - wind, Mvt. 3 - fire (sun), Mvt. 5 - water (rain), Mvt. 7 -earth (farm), and Mvts. 2, 4, and 5 - the quintessence of childhood. My first setting was "The Wind" written in September of 1994. "Farewell to the Farm," serving as the perfect title for the set, was the last poem to be composed. The last movement echoes the wind theme of movement 1. The central movement is a march and is the first to use percussion. An original text by D. V. M., inspired by the episode of Seinfeld entitled "The Strike." This song will have your audience tapping their feet and cheering, wondering if there really is such a holiday as Festivus. Do YOU believe? A cello begins a long flowing melody, then a soft piano joins. Then one voice sings a short and easy solo announcing the theme. She lights a candle. Next another comes out and lights her candle from the first. Then another, and another, until you have a human menorah singing on stage. Eventually, the entire choir joins as the piece swells to a full and beautiful climax. A great show piece for women, or children's choir. These lights we do kindle. What is a hoochie mama? After much research on this topic, I have found that the common answer to this question has this bottom line: suggestive clothing and a flirtatious nature. So I set about creating a piece utilizing my love of Seinfeldian observational humor, while displaying my enjoyment of a really good Ricky Ricardo tune. This song does not pass judgement upon any real-life hoochie mamas. In fact, I took great care to simply tell a story from an innocent bystander's point of view. 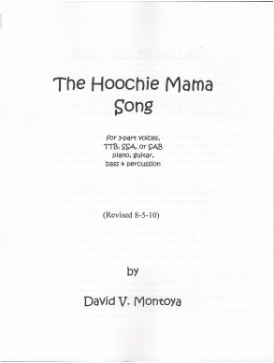 Therefore, the Hoochie Mama Song can be sung by men, women, or both (which should help sales besides). This song is not a rebel song . . . .it is . . . .The Hoochie Mama Song. which rejoices or laments each case in time. This arrangement of the familiar Bach Invention is filled with "pa, pa's" and "dum-digga-digga's." It is NOT a jazz style Bach arrangement. It is pretty faithful to the 2-part keyboard work. It is a joy to sing, and the vocal gymnastics will help to build up your choir's muscular skills. A dear colleague of mine at La Habra High School, Leslie Ferguson, provided this amazing text. Leslie is a wonderful English teacher and a wonderful writer too! The choir keeps the constant tick-tock motif while each part sings a lyric melody of the text. Mysterious and pensive. tongueless in the body of a clock. LA DANZA is a song about the passion of dance and the age-old story of love and trust between and young man and a young women. She wonders that if she gives her heart to him, will she then be "the only dancer" for him. This is a fast and fun song with lots of Spanish flavor and hand percussion to drive the music forward. The piece was originally titled "Cancioncita" and had no text but only nonsense syllables. In the summer of 2014, I sat down with a very talented young student of mine named Andrew Hernandez. 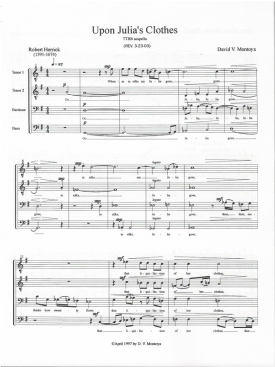 We wrote the story and text for La Danza, and with a little help from our friend Ruth Gonzalez, we had a wonderful piece for a cappella choir. You can hear a MIDI realization below. 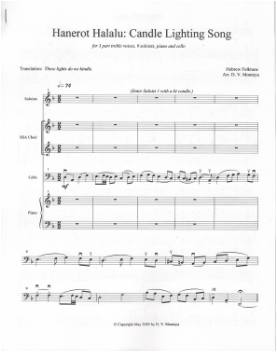 [FREE DOWNLOAD] This is the SATB version of the PUBLISHED SSAA work. I wrote the lyrics to this simple hymn-like work that looks at a mother and child from the child’s perspective. It is not the baby that needs a lullaby. . .rather, it is the frightened young mother. The second verse demonstrates this idea as the choir sings the same tune on a “loo” syllable and on the word “lullay.” This tender little piece is very suitable for Christmas. child and his mother; mother and her child. lullay. he, gently mothering this mother afraid and mild. lullay. and the beauty of her rose, tiny rose. child and his mother; mother and her child. The Light Changes is basically a double round in the Phrygian mode. The Kyrie/Christe round is punctuated by finger cymbals which announce changes of the text from Kyrie to Christe and back again. The cymbals ring louder after each triple statement of Kyrie, Christe, Kyrie. This forms three main sections - a chanted section, a more melodic section, and the round. The piece ends with a chant-like coda. The soloist acts as cantor, intoning the melodies in the second section. In the 3rd section, she sings the words of Rumi as a solo. This can also be sung by a small group. The cello unifies the whole piece with lines that grow from the sung melodies. Additional low and high drone notes give the piece ethereal and shimmering qualities. The combination of Catholic and Sufi literature is important to me in these days when we are in desparate need of tolerance and under-standing between cultures and religions. The idea that "the light changes" suggests to me that it is actually our perception of "the Light" that changes. The most striking line of the piece, "I need more grace than I thought," underscores the changeability of our perceptions. Our changing understanding and our own confusion beckons us to ask for patience and mercy. Thus the use of the text Kyrie eleison compliments the Rumi poem. 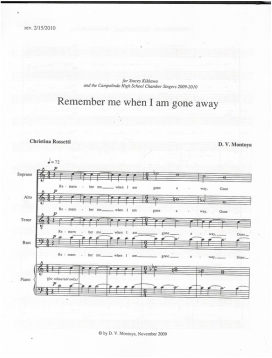 Thanks to Ron Soderwall and the Woodbridge High School Choir for the opportunity to write this piece for their Women's Invitational Choral Festival 2006. The Light Changes was premiered at this festival on November 7, 2006. This piece was commissioned by Claudelle West in honor of the long-time director of the Gloria Dei Choir of Our Lady of Guadalupe Catholic Church in La Habra, CA, Dr. Rick Lopez. 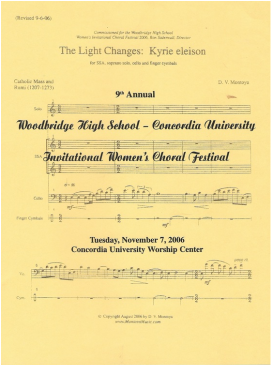 The choir premiered the work in the Spring of 2008 at their annual orchestral concert. This is a three movement missa brevis which includes i. kyrie, ii. sanctus, and iii. agnus dei. 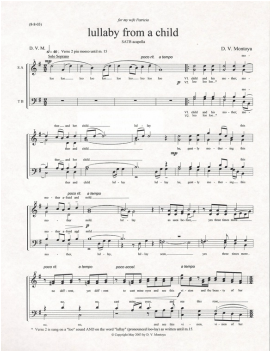 The title means "mass: young boys sing," but it would be equally suitable for an SSA or mixed children's choir. Very suitable for adults or children. 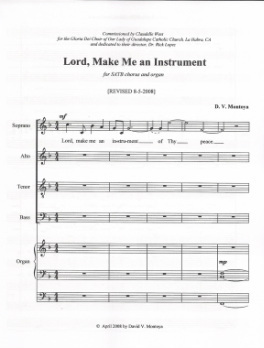 [FREE DOWNLOAD] This short and early work of mine is a tunefully sweet chorale. It has undergone many edits over the years, but is now available for you as a free work. I was moved by the text which came from Pavarotti recording. No author was listed. I wrote and harmonized an original tune in a modern chorale setting. O my sweetest Jesus, hope of a yearning soul. Holy tears search for you, intimate thoughts call you. fill the world with sweetness. 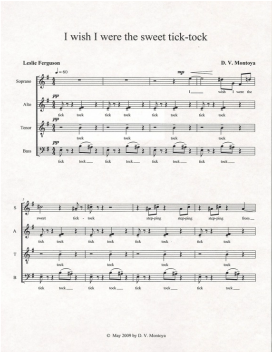 [FREE DOWNLOAD] The Overtonal Alleluia is simply a melody designed to be sung first in unison, then in a two-part round, and then freely by each singer, all to the background of chimes or hand bells, playing a tonic-dominant drone. 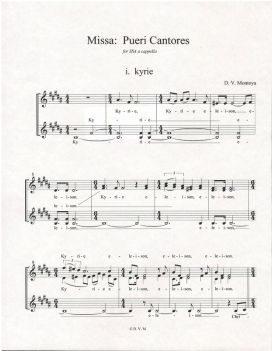 This piece was performed by the Harvard-Westlake Chamber singeres, conducted by Jayne Campbell, at Western Division ACDA, Los Angeles in March of 2000. You are free to duplicate and perform this work. Click below for a PDF copy. This piece was written for Stacey Kikkawa and the Campolindo High School Chamber Singers. The text was selected by Ms. Kikkawa and the setting was what Allaudin Mathieu would call a "magic mode" piece. It is a 12-tone work, but not atonal. The scale is a 12-note scale instead of our familiar 7-note scale. Each note swirls around the tonic and dominant notes, and you are always in the key of C (or G when the piece modulates). But, since there are 12 tones to choose from F notes and F#s can mingle in the same bar or even harmony, as well as other pairs of tones. A very unique piece that suits the text well. SICUT CERVUS (SSA) is a work that has waited a long time to find it's place in my repertoire. It was recorded in the Fall of 2013 by some very dear friends of mine. Let's bring back counterpoint! The name of the game is "water" in this lovely piece of modern counterpoint for women's voices. It is an ABA setting beginning in A Major, moving to the minor sub-dominant of d minor, and then returning to the tranquil waters of A. I hope you enjoy this recording of "As the Deer Longs." The premiere took place on February 7, 2014 at the University Presbyterian Church in Seattle, Washington. Brad Pierson gave a BEAUTIFUL reading of the piece with his superb choir whateverandeveramen. Please visit the SONGS OF FATHERHOOD - WORLD PREMIERE page on Facebook. Below are the audio recordings of each movement. You can also watch the entire video of the premiere, including Mr. Wallis reading his poetry. The 2nd performance took place on Saturday, August 9, 2014 in Glendale, California. The 3rd year students of the California State University, Los Angeles Three-Summer Master's program studied, conducted and sang the five songs in the beautiful setting of the Glendale City Church. They did an AMAZING job, as did the entire choir, and I am so proud to have had them perform the work. Thank you Dr. Sebastien Vallee! SONNET 65 was commissioned for the Phoenix Bach Choir's silent auction. Dr. Timona Pittman won the right to commission the composer and a wonderful donation was made to the choir. This piece is an advanced piece for choir based on Shakespeare's poetry. The recording on the HOME page is of this website is of the premiere performance. [FREE DOWNLOAD] This is one of my earliest works. It was premiered by Ruth Ballenger and her summer Guinea Pig Chorale. Other notable performances were the UNLV Chamber Choir with David Weiller conducting, the Fullerton Union High School Vocal Ensemble, and the El Cafe Chorale of Costa Rica. 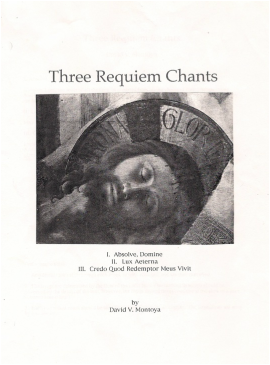 The piece is based on the Gregorian chant of the same name. 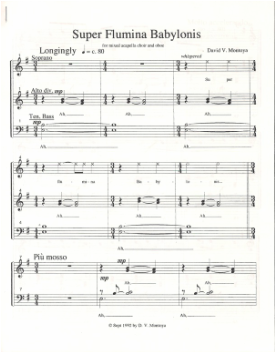 Sections of the chant setting are interspersed with solo oboe lines. At the end of the work, the oboist leaves the stage and the choir sings a gentle chorale. Halfway through the chorale, the oboe is heard singing offstage, and the piece comes to a peaceful close. It was there, among the reeds, that we hung up our instruments. You may copy and perform this work at no charge. 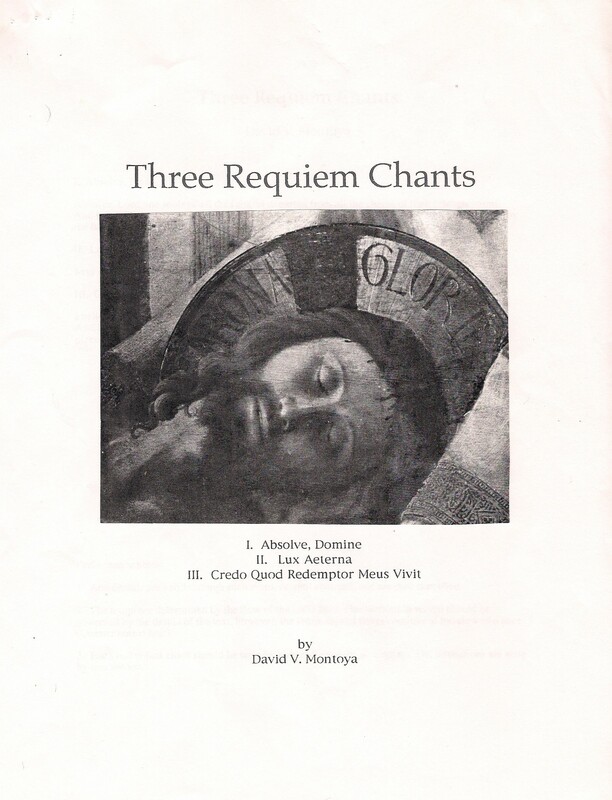 [FREE DOWNLOAD] This work combines the supple rhythmic flexibility of Gregorian chant and principles of 12-tone atonal music theory to create a new and unique kind of chant. The chants are primarily unison (or octave) singing, but they also split into 2 or 4 parts at times. You may download and perform this work for free.